The Pompey Pet Nanny offers half hour puppy visits in Portsmouth to include encouraging play with your puppy, feeding, lunchtime meals and toileting breaks. The Pompey Pet Nanny is also a friendly cat sitter in Portsmouth & Southsea, available to check and feed your cat(s). Kath visits your cat giving them attention as well as looking after your property while you are away. 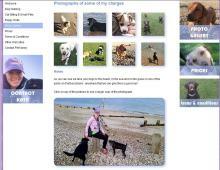 Similarly Kath can provide pet sitting in Southsea & Portsmouth including birds, guinea pigs, rabbits and rats. Contact Kath regarding any other small animals that may need care while you are away and she will be happy to help.